The first 4K-ready Super35mm camcorder in its class – providing an assured upgrade path to 4K acquisition and delivery - with full HD 1080p for today.The camcorder will also have the capability to produce 4K RAW 3G-SDI output via a future upgrade. Incredible super slow motion capability of up to 10x slow motion at full HD resolution or up to 40x slow motion at a reduced resolution, giving you creative options that were once only available with specialist high-end equipment. The E-mount interchangeable lens system utilises an extremely short flange back distance allowing you to use a huge array of lenses via a range of adaptors giving you almost unlimited creative options. The NEX-FS700E features built-in, ultra-thin ND filters, offering exceptional shallow depth-of-field on highlights. It also means less accessories to manage as no external ND filters are required. The NEX-FS700E has a refined ergonomic design with a robust detachable handle and grip. 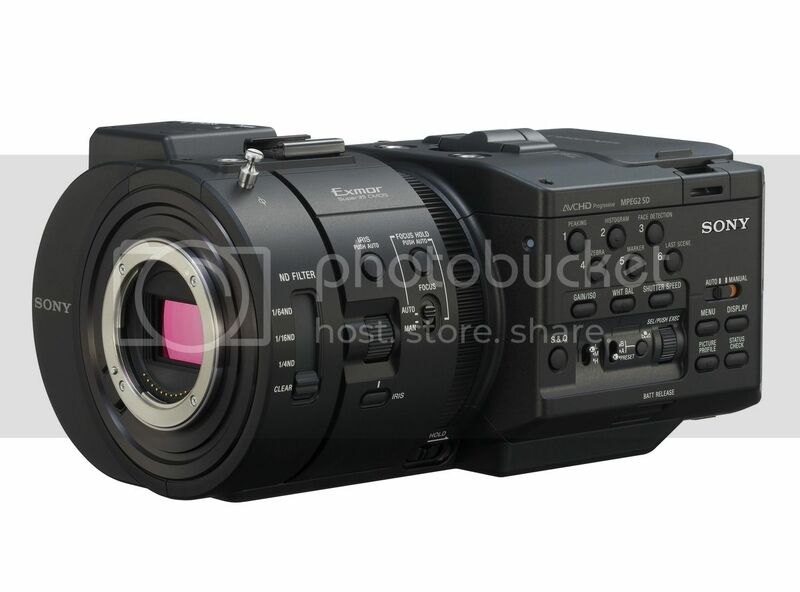 The NEX-FS700E is switchable between 50 Hz and 60Hz to allow 24p shooting in PAL areas and no PAL/NTSC limitations. Exciting times, hope the specs are true. This looks like the first "pro segment within budget" camera in a long time that truly will give more features in one package. The Canon C300 will look very overpriced in comparison. The 4K EOS needs to deliver, but seeing how Canon protects segments, it won't suprice me if the 4K EOS will have some strange shortcomings. I'm not too happy about the e-mount, but it seemes ok to use adaptors, and I suppose Sony will provide quality in their coming G-series lenses. Very good, and Sony make cameras with a great cinematographic look. Panasonic so need a camera 4K. I really don't see any need in 4k resolution for screening purposes. Shooting 4k would have advantages, mainly being able to shoot medium and crop the same take for a close-up. And of course you'll likely get high frame rates at lower resolutions. Well maybe, but if it doesn't well is a very nice cam. JVC is already selling a sub 10,000 dll 4k cam, canon announced it also (not sure about price) so 4k in Sony is a matter of months. @ChainsawFilms, thanks for the awesome link. It ain't the cost of the cam's....it's the cost of the TV's/monitors needed to enjoy/edit that footage. I can't find any monitors that show 4k, and the ones I do find have no prices listed. Here's the prices needed for 4k to become mainstream....40" 4k LCD TV for under $700. Once that happens....game on. I bought my 1080p 42" for $600 a couple of years ago and now I see 40" routinely around low $300. Price is everything. I was at Sony Pictures the other night for one of their F65 demos. It's footage was being projected on a 40 foot screen and looked tremendous. I was also talking to their head of marketing and he said that they are going to be pushing 4K as the next "Big Thing" in home displays. He also mentioned that he sees movies going straight to the home at launch. I know this is not anything that we don't see coming it is just interesting to hear the suits talking about it. By the way, the latitude in the F65 was beyond impressive. We were pulling information out of the "Blown Out" highlights that are not possible with any other camera that is on the market right now. If people are interested I can probably post a frame grab or two. @Bueller So that exceeds Epic HDRx and Alexa in highlight recovery? Or just Epic (no HDRx) and Alexa? Or were you thinking in relation to other entirely different cameras? @thepalalias The darn thing smokes both those other cameras. We did some shooting in downtown LA at night. We set the ISO to 800 (which is really just semantics because the thing just takes in everything raw). When we took what looked like blown out windows from a CVS and then brought them down in color grading you could not only see the lady in the back of the store wearing a hat but you could tell it was a pink Dodgers hat. It was like we covered the windows with ND6. Far and away better than the Alexa and the Red HDRx (I have graded for both). The thing is a beast. Probably the next standard for big budget feature films from a digital standpoint. Yes it would be nice if you could post some of these frame grabs. Sony sensors have been getting better and better for DR. It seems that for the last 4 years they have been working on it. Sony based sensor camera like the Nikon have been constantly been getting better and better at it, while Canon for example have stagnated around the 12 stop of DR.
@Bueller Very interesting possibilities. I look forward to any demos that may arise. @Bueller "The darn thing smokes both those other cameras." "Sony based sensor camera like the Nikon have been constantly been getting better and better at it"
+1. The new D800 looks great. Dynamic range is in 13-14 stop range for video now... Alexa territory. it is not an april fools joke. @LumixUser "D800 does not have a true 13-14 stops... thats BS..."
Just saw a video the other day where someone shot a gray strip with the D800 and you could just barley see the 14 stop mark. It's really not magic. It's just good technology. Any good modern sensor should be capable of 13-14 stops now. Now, it probably doesn't have that much DR for grading and manipulation... but it looks like the sensor is "seeing" and making an image with 14 stops of light range. FPS: 120, 240, 480, 960 frames / second. 120 and 240 frames per second in Full HD 480 and 960 pictures in reduced quality. Looks like it's going to be a beast. Yep, while 1080p60 will become standard in all new HDSLRs, higher fps will be standard among pro cameras. @Bueller: Id love to see some grabs from the f65 if you can... Id love to try it myself really but none of the rentals around here have it. @bwhitz do you have a link for the gray strip, would like to see it.